You’ll undoubtedly have lots of wonderful memories to cherish from your wedding day, but one way to evoke cherished memories is to choose a new perfume to wear for the first time on your big day. In future, whenever you spritz that scent, you’ll be transported right back to the excitement and enjoyment of your wedding day. So how should you select your new fragrance? Woodhall Manor’s wedding planners are here to share their top tips. As you are well aware, weddings are all about meticulous planning and choosing a new perfume for your wedding day is no exception. Many brides aren’t sure whether to stick to a signature scent on their wedding day, or choose something new that will forever remind them of their special day. 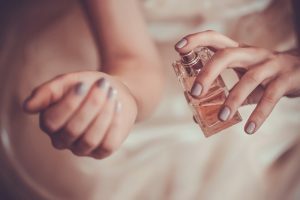 We think it’s a fabulous idea to choose a new perfume especially for your nuptials, but as with all purchases for your wedding day, it requires careful thought. First, take into consideration the type of wedding you’re having and when you’re getting married. 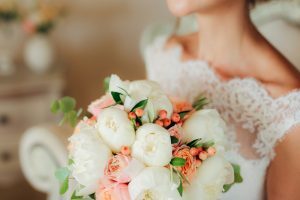 If your wedding is taking place in the height of Summer and has a romantic, English country garden theme, together with bundles of fresh flowers and an outdoor reception, then a floral fragrance would be ideally suited. However, if your wedding is due to take place in the Autumn or Winter months, or you’re having a more mood-enhancing evening ceremony, then you may want to choose a more heady scent, maybe something warm and sensual with scents of amber or sandalwood. To help your search, start off by thinking about perfumes that you know you like and try to work out if there are any common characteristics. It may be that you tend towards woody, spicy scents, or maybe light, citrus fragrances are more your style? 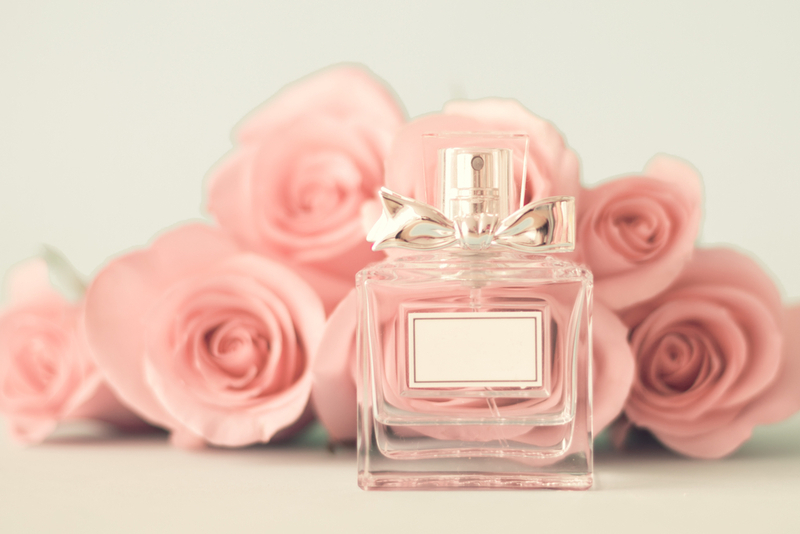 If you have some grasp of your personal preferences it will definitely help guide you when you begin your search for your wedding day perfume. Now is not the moment to choose something completely out of keeping with your normal fragrance choice. Whatever you opt for needs to complement your natural style and be true to you. With all fragrances, it’s important to allow them time to develop on your skin before making a decision. When you first spray a perfume, you only smell the top notes which are often the lightest, and these will disappear after a while. Leave all fragrances an hour or so to develop and then smell them again on your skin to see how they’ve altered.  The base notes will now be detectable and it may be that you don’t love these as much as you’d hoped. Whatever happens, don’t rush into any decision. Take your time to appreciate each perfume you try and if it makes you more comfortable, return on another day to try them again to be sure of your selection. It may be tempting to try everything in the perfume hall, but remember that once you’ve got more than a couple of different fragrances on your skin, they will all start to mingle and it will be difficult to identify the ones that you like. We suggest limiting ‘on skin’ tests to no more than three so that you can clearly smell each one. We also recommend getting a second opinion, probably from the groom! We think it’s important that he likes the perfume you’ve chosen for your wedding day. So what’s our favourite wedding perfume? At the moment it has to be Star Magnolia from Jo Malone. Described as “Delicate white blossoms bursting with spring’s sparkling charm. Star Magnolia is in bloom. Tantalising. Flirtatious.” We love this beautiful, sensual fragrance and particularly love the fact that it comes not only as a cologne but also a limited edition hair mist. We’re so tempted right now! Woodhall Manor is proud to have a team of wedding experts who are perfectly positioned to help you plan your perfect day. Why not give our amazing wedding planners a call today on 01394 411 288 or email info@woodhallmanor.com to book a private tour of our stunning country Manor house.